The title of this post does not refer to the vanity plates on my Chevy Avalanche. 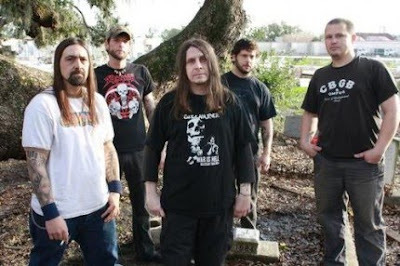 The letters, in fact, represent a unique feature that Eyehategod are offering as part of their VIP ticket package. Yes, you read correctly. Eyehategod are offering a VIP deluxe show experience at select venues on their forthcoming tour with Brutal Truth, Nachtmystium and Black Anvil that includes a BBQ, soundcheck access, a meet & greet and a limited-edition poster. At only $40, this unique opportunity far surpasses what super groups like KISS, Bon Jovi, or Rush are offering (and at way higher prices)—and you just know that this one will have a lot more band/fan interaction. 2. Will there be vegetarian options? 3. How many selections will there be for the white drugs course? 4. Is this a BYOB affair? 5. Will they consider a similar package in NYC that includes a vodka tasting and perogi dinner? Real talk, though, I'm thrilled as hell to be seeing them at Europa on June 12. And I'll be bringing Ess-a-Bagel for Sharp. 6/04/2010 Ground Zero - Spartanburg, SC ** 50 VIP ticket packages available for $40 each; includes soundcheck access, BBQ, meet & greet with the band + a signed poster. 6/06/2010 Headliners - Louisville, KY ** 50 VIP ticket packages available for $40 each; includes sound check access, BBQ, meet & greet with the band + a signed poster. 6/10/2010 Krug’s - Frederick, MD ** 25 VIP ticket packages available for $40 each; includes early entry, soundcheck access, meet & greet with the band + a signed poster.